FRANKLIN COUNTY – Funeral services for John Derek Gupton of the Justice Volunteer Fire Department were held on Sunday, September 21st at the Duke Memorial Church in Spring Hope. UPDATED – FRANKLIN COUNTY – A firefighter was killed and another was injured Tuesday afternoon after the fire truck they were in overturned in Franklin County. Arrangements have been posted. 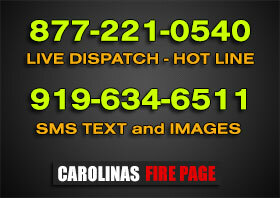 LOUISBURG – The Louisburg Fire Department responded to a single vehicle wreck on Sunday, Feb 2nd at approx 12:55 p.m. Arriving units found a single vehicle down an embankment on it’s side with 2 female victims trapped in the overturned car.